Madeline “Maddee” Talbot has her hands full when she agrees to take in her younger sister, Nicole, following a serious car accident. The young women grew apart when Nicole fell into drug addiction, and Maddee prays this will be the start of a better life for her sister. But as they investigate a trauma from their childhood, Maddee must keep a diligent eye on Nicole—and the shadowy figure watching them from afar. Mindy Starns Clark is the author of many books, which include the popular Smart Chick Mysteries, Whispers of the Bayou, Shadows of Lancaster County, and Under the Cajun Moon. In addition, Mindy’ s plays and musicals have been featured in schools and churches across the United States. "This was such a fun book to write! My favorite part was how, as we worked, we started seeing several significant parallels between the historical story and the modern one. We knew going in that the two stories would have a few things in common, such as the fact that both would focus on a pair of sisters and would be told from the point of view of the elder sister. But then as the writing progressed, other common elements began rising to the surface as well, almost as if our unconscious minds were making connections we hadn't anticipated. That probably sounds strange, but I've just never seen a book come together in the end in such a cohesive and connected manner—and that's despite the fact that it was written by two different people living on opposite coasts and covers two time periods set more than 300 years apart!" "Reaching beyond its romance elements, the novel deftly highlights the loving but sometimes difficult relationships between unique pairs of sisters. Maddee and Celeste's plots mirror each other well without overlapping. Clark and Gould handle the parallel time frames with aplomb, providing a solid sense of setting to keep the reader grounded and expertly intertwining the historical and modern story lines.... This novel is a satisfying tale for those who enjoy both contemporary and historical fiction." "This book has a dual storyline that captures readers' attention with vivid characters. It's the second in a series but can be read independently. Themes of trusting God for direction and praying without ceasing are incorporated into this memorable story." 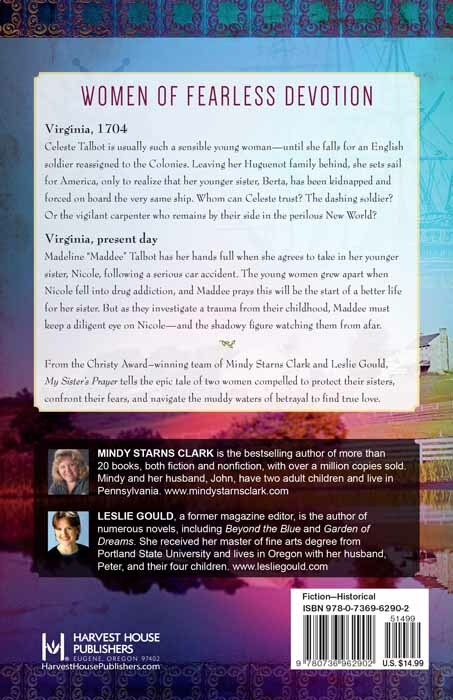 "In My Sister's Prayer, Mindy Starns Clark and Leslie Gould weave an epic tale across centuries.... I highly recommend this book to anyone who enjoys good fiction, both contemporary and historical." "Each book in this series just gets better and better, and readers will find much to enjoy in the pages of My Sister's Prayer. Fans of stories that expertly blend history and contemporary plots with wonderful spiritual elements are going to love this one." This second book in the Cousins of the Dove series continues the tale of the Talbot family and follows a dual timeline: 1704 Virginia and the present-day. The two story lines switch back and forth in a complimentary way, plus they hold a family connection. Sisters Celeste and Berta, find quite the adventure but not what they expected. Maddee and her sister, Nicole, read the letters sent home by their 18th-century relatives. Both sisters’ lives hold lessons for readers to explore and glean from as they enjoy a well-told story of strife and life. The characters are very realistic, and the authors draw you right into the drama. I recommend all the books by these skillful writers. The Talbot family saga continues with this My Sister’s Prayer - the story is a back-and-forth telling of the present day and 1704. This is the second book in the Cousins of the Dove series and it is an interesting look into the past and how indentured servants came to the this New World. It would be interesting to know how many arrived on false promises. This is absolutely, positively an excellent book. I couldn’t stop reading it. The first book was also excellent and it just keeps getting better as the series goes on. My Sister’s Prayer is the second book in the Cousins of the Dove series (My Brother’s Crown is the first book). The books can be read as a stand-alone or in order as a series. But, if I were you, I would start with the first book and read them in order to better understand who the characters are, where they come from and to be able to follow the story between the two time periods. There will be two more books of the series coming out in 2017 and 2018. I don’t know if I can wait that long!! I am really enjoying this series and you will too once you start reading them. I highly recommend My Sister’s Prayer (and My Brother’s Crown). I loved this book. It is so interesting to me to have the story started in My Brother’s Crown pick up from a different cousin’s perspective. Very clever premise. I can’t wait to see what the next book brings! This historical sections were more informative and interesting than riveting but they set the stage for understanding the parallel story in present day which makes this a page turner. Let me just say I enjoyed the first book of the Cousins of the Dove series, My Brother’s Crown, tremendously. This second book in this dual time series did not disappoint. I can honestly say I am looking forward to the third book in the series as well. Mindy Starns Clark and Leslie Gould are excellent at what they do, and what they do is masterfully weave historical and contemporary Christian fiction story lines together into a series of rare gems. Their characters are highly relatable and compelling. I must admit I am a new Clark and Gould fan, and I am in the process of reading their previous works. Amazing! My Sister’s Prayer by Mindy Starns Clark and Leslie Gould is the second book in the Cousins of the Dove Series. It is one that you definitely won’t want to put down! A historical masterpiece! I have really enjoyed reading the first and second book in this series. The characters are so real and you feel like you are right there with them during their happy times and their most frustrating times. This series is definitely one you will want to keep on your bookshelf to reread from time to time. I cannot wait until the third book is released! From the first word to the end of the story, I could not stop reading. The authors tell a tale that encompasses present day and time in the 1700’s. The descriptions of being aboard the sailing ship, landing on new ground and the awful conditions of that time are brought to life with the emotions of the characters. The feelings of the characters in present day story line are real and heartfelt. I enjoyed this book so much that I plan to read it again. 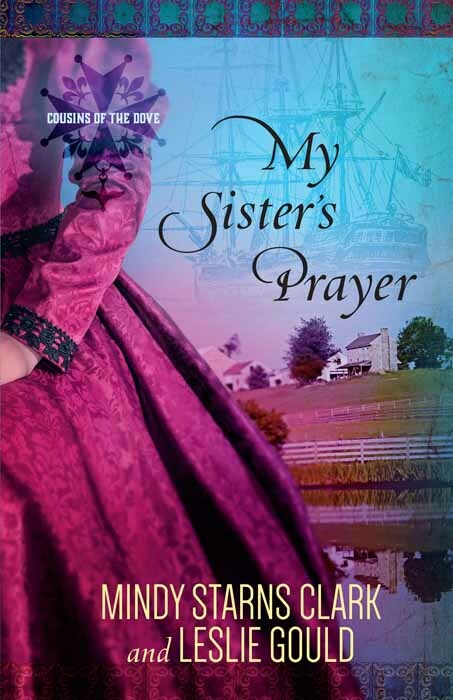 My Sister’s Prayer is the second in the Cousins of the Dove series, but can be read as a stand-alone book. The story continues and follows the thread of the mystery in the first book, My Brother’s Crown and the Talbot family. The story-line goes back and forth from Virginia of 1704 to present day and back again, but is easy to follow the time-lines as they are clearly marked. There are some similarities in the sisters stories in both time-periods as the sisters face difficult challenges, struggles and consequences of their choices which impact others as well. I love the historical elements in this story (my favorite part of the story) and the way the authors tied the two time-periods together bringing the past to the present in this family’s lives. There are clues to the mystery from the first book that is yet to be solved. The characters take the reader on a journey of adventure, betrayal, joy, slavery and indentured servants, guilt, healing, forgiveness, and love. I love the theme of strong family, faith, prayer and God’s grace. This second book in Cousins of the Dove series is very good. The story goes back and forth between the early 18th century and the present day and continues the story started in My Brother’s Keeper. It should not be read as a stand alone, in my opinion, or the reader will feel that they are missing something. Mindy Starns Clark and Leslie Gould have done a wonderful job of telling this tale. I enjoyed it very much. It was well written and thought provoking. I especially like it that the past part of the tale has been moved to the New World in America. Their descriptions are very vivid and captured my interest very much. The present day tale is also very well done and I enjoyed it all. This is a wonderful historical/contemporary romance! This book is part of a “true” series. You need to read the first book to truly understand and follow this story. The characters in the book are extremely well developed and I was able to quickly connect with many of them. I related the most to Celeste and Maddee. I enjoyed seeing how each of them learned to accept that life isn’t always neat and tidy. They also had to learn that they weren’t responsible for the consequences that others have to face because of their own choices. This is something that we all need to learn and some of us have a much harder time learning it. Both Celeste and Maddee work hard to remember to take their concerns for themselves and their sisters to God in prayer. I found a number of parallels among the main characters between the two time periods. I was fascinated by the similarities between the two sets of sisters. I just finished reading My Brother’s Crown. I loved the book. Loved the history. Did not know the history about the Huguenots. I can hardly wait for My Sister’s Prayer . Very interesting. My kind of reading. "With My Sister's Prayer, the Starns Clark and Gould team has hit yet another one out of the park. The characters are charming, engaging, witty, and well thought out. The reader is moved effortlessly back and forth between 1704 and present-day. My Sister's Prayer is a true work of art and I am now counting down the days to Book Three! "My Sister's Prayer did not disappoint! This book is wonderful, and I had trouble putting it down.... Do yourselves a favor, and read this book as soon as you can!" "Mindy Starns Clark and Leslie Gould have again produced a winner!"